VietNamNet Bridge – The National Assemblies of Vietnam and Cambodia signed an agreement in Hanoi on July 22 to strengthen the traditional friendship and cooperation between the two legislative bodies. 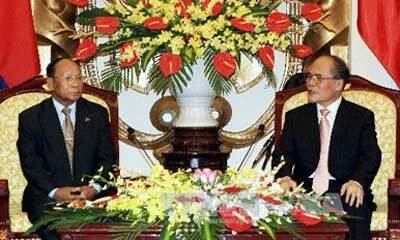 NA Chairman Nguyen Sinh Hung (R) welcomed his Cambodian counterpart Heng Samrin in Hanoi on July 22. The signing ceremony took place shortly after high-level talks between Nguyen Sinh Hung, Chairman of the Vietnamese National Assembly, and his visiting Cambodian counterpart, Heng Samrin. Under the agreement, the two legislative bodies will specify areas of cooperation to ensure their cooperation programs will be more practical and efficient in the future. They will increase the exchange of visits by high-level delegations, NA committees, agencies and parliamentary groups. The Vietnam National Assembly Office and the Secretariat of the Cambodia National Assembly will also increase exchange visits to share experiences, and jointly organise workshops on issues of mutual concern. Hung and Heng Samrin held that the signed document will help contribute to maintaining durable peace and promoting cooperation in a sustainable manner in Vietnam and Cambodia, as well as in Southeast Asia, the Asia-Pacific region, and the world at large. During their talks, Hung and Heng Samrin expressed their desires to deepen cooperation between the two legislatures, especially in external affairs, and share experiences in lawmaking and supervision. They said the two bodies will work closely with their governments to effectively implement signed agreements so as to boost bilateral economic and trade ties, as well as exchanges between border localities. Hung assured his guest that in its open external policy Vietnam gives priority to developing traditional relations with neighbouring countries, including Cambodia. He described Heng Samrin’s visit as significant for the Vietnam-Cambodia relationship as both neighbouring countries are celebrating their friendship year 2012 and the 45th anniversary of diplomatic ties. For his part, Heng Samrin stressed that his visit aims to further strengthen the time-honoured relationship and comprehensive cooperation between Cambodia and Vietnam. He took the opportunity to thank the Party, State and people of Vietnam for assisting Cambodia during the past struggle for national independence, and the present cause of national construction and defence. In the evening, Chairman Hung hosted a banquet in honour of Heng Samrin and his entourage. The top Cambodian legislative chief began an official visit to Vietnam on July 20 at the invitation of NA Chairman Nguyen Sinh Hung.